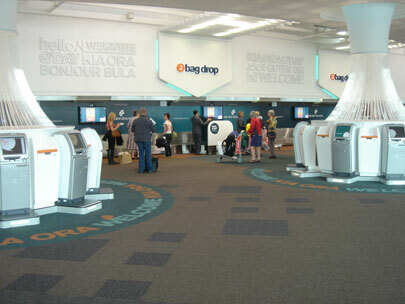 Air New Zealand approached Wallflower Global to develop a technique for displaying disruption information in airport terminals using Digital Signage Software. The Wallflower solution utilises the Symantec Altiris network management tool to deliver branding and promotional media to displays located above baggage drop-off points in terminals through New Zealand. Whenever a disruption is notified staff at a national and local level can quickly prepare appropriate messages to be displayed. The Wallflower Scheduler provides a technique to show high graphic quality messages using pre-prepared templates that staff update by selecting from drop down lists of destinations etc. Wallflower then transmits the messages immediately to all displays.